What Happens to Offshore Drilling After the Gulf Oil Spill? “It turns out, by the way, that oil rigs today generally don’t cause spills. They are technologically very advanced.” That’s not a joke–President Obama actually said that on April 2, soon after he announced a plan to expand offshore oil and gas exploration. What a difference a few weeks makes. In a nutshell: BP’s Deepwater Horizon oil rig exploded; approximately 210,000 gallons of oil are now seeping into the Gulf of Mexico daily; animals, wetlands, fisheries, and local tourism industries are all threatened; and now Gov. Charlie Crist has declared a state of emergency. 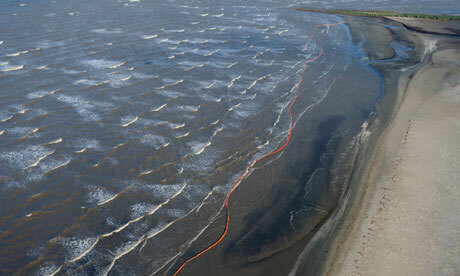 The spill has also officially reached the Louisiana coast–and it smells. And now, exactly one week after politicians confidently assured us that the spill won’t affect drilling plans, Obama has declared a moratorium on new drilling until the government figures out why Deepwater Horizon exploded. Does this disaster mean long-term problems for offshore drilling? After a similarly unrelenting spill from an oil rig near Australia last year, oil companies went before Congress and promised that this couldn’t happen here in America. In September, David Rainey of BP testified before the Senate that their offshore technology was “safe and reliable.” He pledged that “any release from our operations is unacceptable.” Eight months later, the Coast Guard has set the ocean on fire in an unsuccessful bid to stop the spread of BP’s oil in the Gulf. It’s not just environmental organizations that are worried. While the federal government’s official line is that drilling will only be halted until the Deepwater Horizon investigation is complete, many politicians are jumping on the opportunity to stop offshore drilling permanently. Senator Bill Nelson of Florida is introducing legislation to stop Obama’s drilling plans, claiming that any Senate climate and energy legislation will be dead on arrival if it includes provisions for increased drilling. And four New Jersey lawmakers–Sens. Frank Lautenberg and Robert Menendez, and Reps. Frank Pallone and Rush Holt–reiterated their opposition to offshore drilling in a letter to Obama. We won’t go into detail on the potential environmental and human impacts of the spill–you can read about that in our earlier post–but the Obama administration won’t likely have an easy time shoving offshore drilling down our throats once the tragic pictures and anecdotes start pouring in.